The Christmas Crystalabra Trap is a Limited Edition Rift type weapon and is part of the Riftwalker Set. A golden Christmas candelabra modified to hold powerful Rift crystals, this trap is a great holiday decoration that also doubles as a fully functional Rift trap. Plus, it looks great on the dinner table! 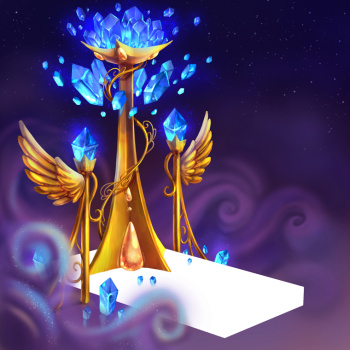 The Christmas Crystalabra is in tune with the unknown energies of the Rift. Whenever a mouse caught by this trap drops Calcified Rift Mist, the crystals will hum and discharge energy creating one additional Calcified Rift Mist! The Christmas Crystalabra Trap is a Limited Edition weapon. It was available for sale in the Great Winter Hunt 2017 Trapsmith for 150,000 gold and 1 Nugget of Nougat. The Christmas Crystalabra Trap acquires a 20% Power Bonus when armed with Snowball Charms. Rift Plane: With the Christmas Crystalabra Trap armed in Rift Plane areas, one additional Calcified Rift Mist can be obtained if the mouse drops Calcified Rift Mist when caught. 12 December 2017: The Christmas Crystalabra Trap was released as part of the Great Winter Hunt 2017 event. This page was last edited on 27 January 2019, at 01:32.